When it comes to roofing underlayment, it’s something to not take lightly. Making sure that your roof is in tip-top shape is very important. You do not want to wait to the very last minute to come to find out that you’re in need of a new roof. However, if that’s the case, you’re in luck. Eastbrook Roofing and Construction working in Livingston, Washtenaw, Genessee and West Oakland County can help you. What is Underlayment Paper on Roofs? Roofing underlayment, also known as “felt paper”, is the first layer of waterproofing materials that lay down as the foundation. It’s basically a roll of fiberglass or paper that is saturated with other waterproofing materials and asphalt. There are two types of roofing underlayment: traditional felt paper and synthetic. Local professional roofers or roofing companies should know what’s best, but it never hurts to know. So, before choosing which type is best for your home, here are a few things you should know about both. The most common type of felt paper that people normally use is the regular or “traditional” felt paper. For most roofing companies, this type of roofing underlayment is used more frequently than the synthetic underlayment. It is made out of wood and asphalt and is strong enough to help prevent damages, leaks and deterioration. There are four different kinds of synthetic roofing underlayment: polyester, fiberglass, polyethylene and polypropylene. For the most part, this underlayment offers the same benefits as traditional felt paper and are fairly easy to install. It is long-lasting (how long we don’t know, hasn’t been around long enough). There are quite a few disadvantages to both roof underlayments. 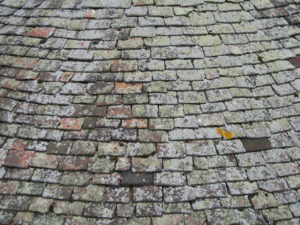 Traditional felt paper is heavier and more slippery and synthetic roofing underlayment is more expensive and doesn’t work well with seepage. When choosing the type of underlayment you want for your roof, it is always good to see what your roofing contractors prefer. Although synthetic roofing underlayment seems like the right choice, Eastbrook Construction favors traditional over synthetic. When it comes to fixing a customer’s roof, we do not add another layer of shingles to fix the problem, like the others do. We don’t even recommend that you do such. We at Eastbrook take our time to redo your whole roof, using our traditional felt paper. Are you in need of a roofing repair? Please give us a call at 248-877-9247 for a beautiful transformation.